Alpha Phi Omega is committed to providing every interested college student in the U.S. and Canada with the opportunity to be a part of APO. More than 90 years of experience has shown how important the support of the school’s administrators is to the long-term success of a chapter, and the Fraternity continues to look at new ways to grow and improve this vital partnership and help support the campuses that support APO chapters. The information below is intended to help administrators on campuses both with a chapter of APO, and those seeking a chapter, learn more about Alpha Phi Omega and its mission of developing campus and community leaders through service. Vision: Alpha Phi Omega will be the premier, inclusive, campus-based, leadership development organization through the provision of service to others and the creation of community. Mission: Prepare campus and community leaders through service. The National Fraternity requires chapters to have two faculty or staff members volunteer as advisors on the advisory committee. Faculty and staff members do not have to be members of Alpha Phi Omega to be an advisor. The resources below will help faculty and staff better understand the role of the advisor in Alpha Phi Omega. 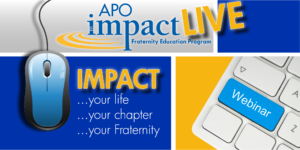 Campuses can support chapters of Alpha Phi Omega by providing leadership opportunities for officers to develop as service leaders. If there are any leadership development courses, programs, or initiatives, chapters are always looking for new and diverse ways to grow and improve, and would be interested in attending or volunteering such events. As there are various leadership development opportunities provided by the National Fraternity, funding is another way campuses can help support chapters. Chapters are also always looking to connect with campus administrators to find new service programs or opportunities on campus.